These ooey-gooey Chocolate Marshmallow Hand Pies are a fun and easy dessert recipe. They are also perfect for eating around the bonfire this summer! There is nothing quite like a warm bonfire on a cool autumn evening with delicious treats to share. One of the best, in my humble opinion, is a s'more. The combination of chocolate and marshmallow melting in your mouth is pretty hard to beat. 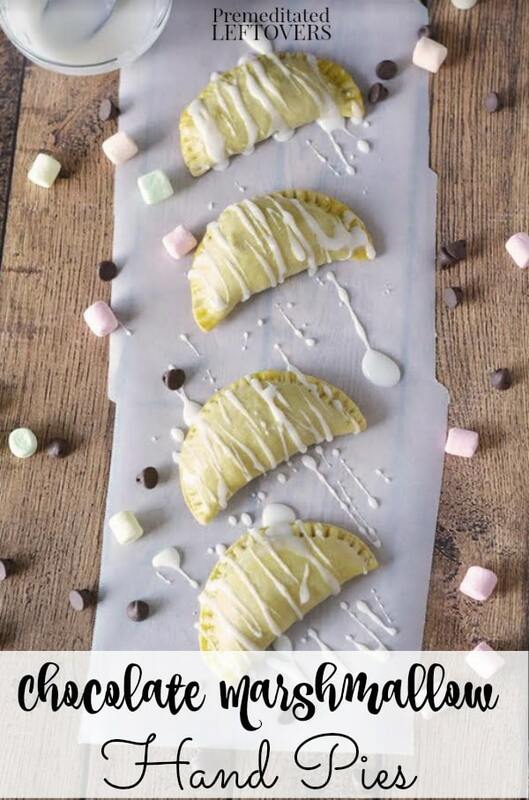 These Chocolate Marshmallow Hand Pies are pretty close, though. If you love the ooey-gooey deliciousness of s'mores, you will love these tasty little pies that you can carry out to the fire and enjoy in the soft glow of the embers. 1. Preheat oven to 400 F, prepare a parchment lined baking sheet. 2. Add flour, sugar, salt and butter in a food processor. Process for about 30 seconds until crumbly. Add 5 tablespoons of water and process. Continue to add more water, 1 tablespoon at a time until dough forms. 3. Remove from food processor and divide dough in half. Cover one half and place into the refrigerator until ready to use. 4. Roll your dough to 1/8″ thickness on a floured surface. Use a circle shaped cutter to cut the dough. The circle cutter used was 4″ in diameter. 5. Remove the excess dough and use a brush to add an egg wash to half of each circle. 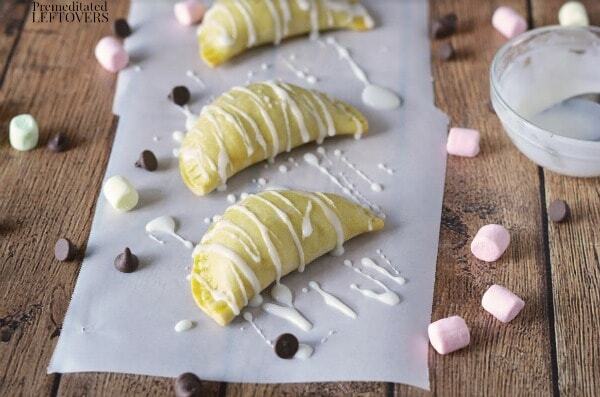 Place a few marshmallows and chocolate chips on one side of the filling and fold over to create a half moon. Seal edges with fork tines and add another swipe of egg wash to the top. 6. Bake on parchment lined baking sheet for 12 minutes or until golden brown. 7. 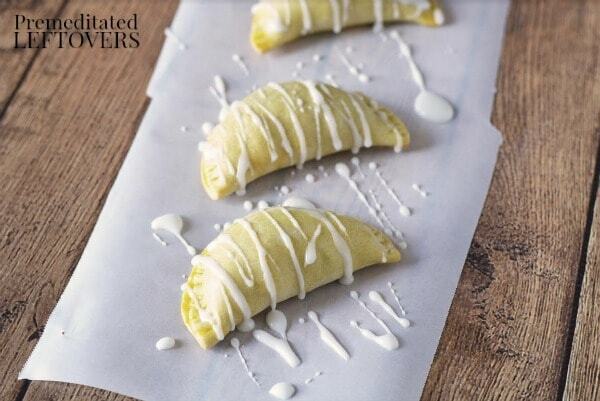 When cooled, drizzle icing on hand pies with a spoon. The marshmallows melt completely so you're left with chocolate and a sweet, sugary center! Preheat oven to 400 F, prepare a parchment lined baking sheet. Add flour, sugar, salt and butter in a food processor. Process for about 30 seconds until crumbly. Add 5 tablespoons of water and process. Continue to add more water, 1 tablespoon at a time until dough forms. Remove from food processor and divide dough in half. Cover one half and place into the refrigerator until ready to use. Roll your dough to ⅛" thickness on a floured surface. Use a circle shaped cutter to cut the dough. The circle cutter used was 4" in diameter. Remove the excess dough and use a brush to add an egg wash to half of each circle. 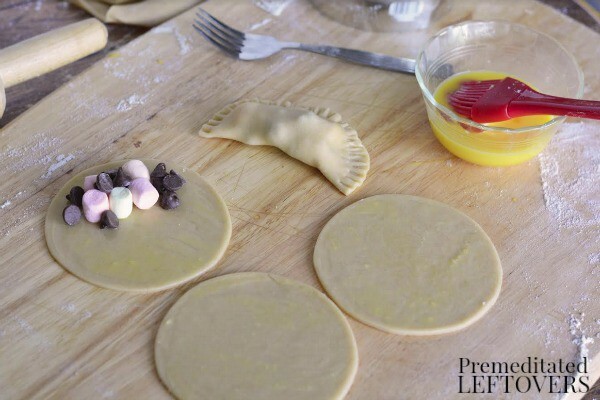 Place a few marshmallows and chocolate chips on one side of the filling and fold over to create a half moon. Seal edges with fork tines and add another swipe of egg wash to the top. Bake on parchment lined baking sheet for 12 minutes or until golden brown. 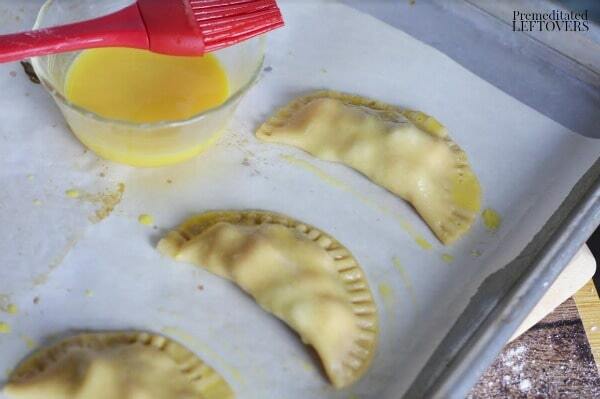 When cooled, drizzle icing on hand pies with a spoon. oh my goodness! melted yummy goodness! Pinned and I’m visiting you from Anita’s today I invite you to share at my Thursday link party ( its open until Saturday at midnight.) Don’t forget to enter the giveaway. Hugs!